The boys are seriously outnumbered in our house. Our washing line is filled with a great deal of pink and Mr Cotton Kiwi insisted on a male kitten when we got Kipper to try and even things out a little. It comes as no surprise then, that I have to work extra hard to come up with ideas for t-shirts and toys for boys. Luckily, I have two young nephews who are willing recepients of my t-shirts and friends with boys to try ideas out on. 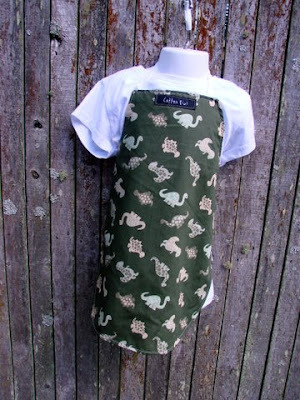 This apron is for sale in the Felt Like Helping Out shop which is closing this weekend. to help them rebuild after the devastating earthquake and aftershocks. 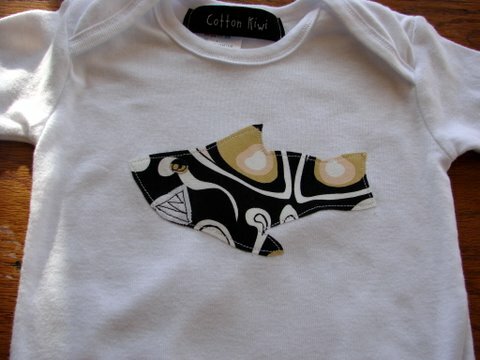 ﻿It was such a thrill at the last market I went to, to have a repeat customer for one of my robot t-shirts. I found out that the t-shirt had been a young man's favourite, but he had grown out of it. I was really happy to make him one in a bigger size. He had a big brother too, who wasn't particularly sure if an appliqued t-shirt would be his thing (who can blame an 8 year old for that?). I mentioned a skateboarder and he quickly changed his mind. The skateboarder isn't part of my regular line as they are really tricky to do, but I'm definately happy to do one offs. 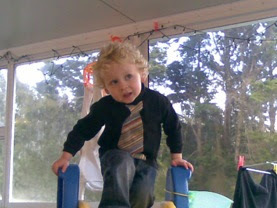 Finally, here's another gorgeous young man wearing one of my neck tie t-shirts. 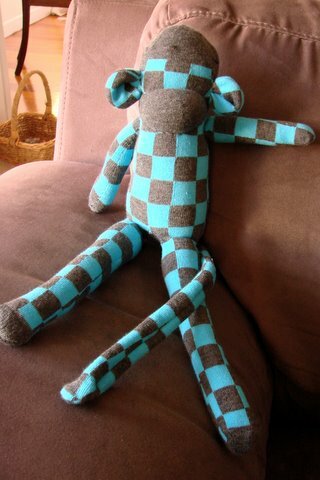 This is the nephew of Aimee from Lilypad Designs. She very kindly sent me this photo of him wearing it. I love to see Cotton Kiwi t-shirts in action! On a completely different note, I am very very close to reaching the 200 'liker' mark on my Facebook page. Once I reach 200, I will be announcing a giveaway so if you haven't already, pop along and join me to be in to win! Love your necktie shirts! Can I "double like" on FB? Wow great work on the t-shirts, I'm feeling all inspired as I finally found Steam a Seam for sale today and snapped some up. That skateboarder is fantastic, great for both big and little boys.